I just read this, not too long ago. There was an op-ed in the New York Times today, by a fellow by the name of Bret Stephens. You should go back and look at a number of his articles, also when he wrote at the Wall Street Journal. He’s a very nasty human being. He writes very, very viciously. And he’s a character assassin. That’s what he is. He’s a character assassin. And many people who worked with him, particularly one or two who have talked to me, have told me he’s [Bret Stephens is] a very nasty guy. And here’s the headline: “Steve Bannon is Bad for Jews.” Now you can say a lot of things about Steve Bannon, but that’s not one of them. So what he [Bret Stephens] does, in a very evil and slick-like fashion, this Bret Stephens in this piece, is throw names around, throws titles around, cherry-picks history, in order to character assassinate. Bannon is very pro-Israel. He’s pro-Jew. I haven’t talked to him in a long time, but I know this for a fact. But in addition, this Bret Stephens trashes an organization called the Zionist Organization of America, headed by a very decent man, Mort Klein. And he [Bret Stephens] trashes that organization for giving an award to Bannon. Now this gutless wonder, this coward Bret Stephens would never write an article titled: “Barack Obama is Bad for Jews.” And the New York Times would never write an article like that, they would never let it fly. Barack Obama is Bad for Jews. No powerful man in the West, more specifically, in the United States, has been more vile and vicious towards the State of Israel and the Prime Minister of Israel than our former president Barack Obama. None. And Barack Obama’s deal with the Iranians has seriously put Israel – and by the way, the Arab gulf states too – in a situation where their very existence is threatened with potential nuclear war. And this clown, this buffoon, this Bret Stephens is focused on Bannon and the Zionist Organization of America. The title should be “Barack Obama is Bad for the Jews.” Let me tell you what Barack Obama did and Bannon did not do. Barack Obama conducted espionage on the Prime Minister of Israel. Barack Obama conducted espionage on members of Congress who disagreed with him on the Iran deal. Barack Obama conducted espionage on Jewish organizations that disagreed with him on the Iran deal. And Barack Obama lied about the Iran deal. They had secret side agreements. Barack Obama was part – more than part – was a leader in an effort to convey $150 billion to the number one terrorist state, Iran. Barack Obama conveyed $1.7 billion in foreign currency to the regime in Tehran, In exchange for hostages. He didn’t want it to be known, so a plane without numbers flew in the middle of the night, landed in the middle of the night, and foreign currency was used. 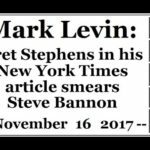 But this fool Bret Stephens, he doesn’t write an article entitled “Barack Obama is Bad for Jews.” He lies about Bannon. And he [Bret Stephens] lies about the Zionist Organization of America. Flat out lies, as he twists the facts, as he throws around labels. And it’s disgusting to me. Because there are real anti-Semites. And the truth is the vast majority of them are members of the Democrat party. The vast majority of them can be found at the DNC. Because in my view, the Deputy Chairman of the DNC, he could have written this, but he didn’t, with his associations with Farrakhan, his anti-Semitic statements: Keith Ellison. Keith X if you will. That he doesn’t write about. What’s going on our college campuses with the boycott movement. That doesn’t deserve attention. Apparently, Bannon is such an anti-Semite that they opened up a Jerusalem office at Breitbart. Maybe Bret Stephens ought to visit it. He used to be an editor over there at the Jerusalem Post. He’s had many jobs, for some reason. So, in a not-so-clever piece, he smears, he rewrites, he character assassinates, because that’s what this character does. And he hates, hates Donald Trump, despises Donald Trump. Go on his twitter account. See the kinds of fights he gets into with Sean Hannity, among others. He’s such a lightweight. 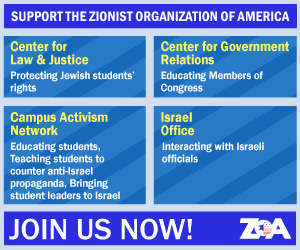 I want to thank the Zionist Organization of America for what they do. You can’t let one column by a half-wit . . . You can’t let one column by a half-wit affect you. And it won’t. His column will be forgotten in a short period of time. I thought I would point it out. Let me ask you guys a question. Are you familiar with the role the New York Times played during World War II to conceal the existence of the Holocaust? The New York Times some time ago, did a study of itself, kind of like Congress passing an anti-sexual-harassment training requirement for itself. A rather thorough-going examination. And others have written about it too. How the New York Times did its very best to downplay the Holocaust. It had infrequent reporting. It pushed the stories to the back pages. And the irony is that Bret Stephens works for the New York Times, that Bret Stephens is paid by the New York Times. That the title the New York Times puts on this piece “Steve Bannon is Bad for the Jews” should really read “The New York Times is Best for the Jews, brought to you by the New York Times.” The New York Times doesn’t support Netanyahu. The New York Times doesn’t support Likud or the more conservative political elements in Israel. The New York Times supported the Iran deal which is a dire threat to our country, Arab countries and Israel. And this fool Bret Stephens is thrilled to be writing for a newspaper that during the height of World War II, during the genocide of Jews, sought to downplay it, in many ways cover it up, push it to the back pages. And they’ve admitted it. The paper of record. They still call it the paper of record. We’re still supposed to believe what’s in that newspaper. And they hire guys like Bret Stephens to inform us, you know, who to like, who not to like, who’s a hater, who’s a lover. Zionist Organization of America has done far more than Bret Stephens ever could dream to do. But Bret Stephens is a hater. He can’t just disagree with people. He can’t just disagree with Trump, or disagree with Hannity, or disagree with the award, or disagree with the award, and ZOA on. You know. They’re anti-Semitic. Now, just think about that sort of perverse thinking. The Zionist Organization of America, according to this clown, is an anti-Semitic Zionist organization. And I doubt he was even drunk when he wrote that line. Very, very troubling. And here’s another irony that this clown [Bret Stephens] will never understand. Donald Trump is more supportive of Israel than George W. Bush ever was and that George H.W. Bush ever was. Got that? It’s true. I’m convinced before the end of his term he will move the American embassy to Jerusalem. I’m convinced before the end of his term he will recognize Jerusalem as the capital of Israel. That would never happen under a Bush. And that would never happen if any of the people who Bret Stephens likes had been elected President of the United States. Why I am pointing him out, since 98.9% of you never hear of him, check that, 99.9% never heard of him? Because he needs to be exposed, for the character assassin that he is, and for his illiteracy when it comes to not just history, but modern history. He writes for a paper, the New York Times, that I would argue did Hitler’s bidding by, if not covering up, certainly downplaying to the back pages, and the inside pages of the newspaper, the absolute slaughter, inhumanity, genocide against the Jews. And this guy [Bret Stephens], who’s a Jew, is writing to attack the Zionist Organization of America. It just shows how perverse they are. The hate for Trump, the hate for anyone or anything attached to Trump, is just incredible. You can have disagreements with Trump. Look, you can have disagreements with his policies and so on and so forth. I’m a Constitutional conservative I don’t claim to be a nationalist populist. So what! We debate the ideas. We decide. You don’t start comparing people to anti-Semites because they happen to disagree with Bret Stephens, when their record is absolutely the opposite. And I know this for a fact, for a fact. Now watch, this clown will say I’m an alt-right white Supremacist. Try that Bret. You better make sure you have a very, very hefty bank account. I don’t take crap from jerks like you. [This article is a transcript of Mark Levin’s radio show. ZOA is a fully bipartisan organization and neither supports nor opposes candidates for political office].